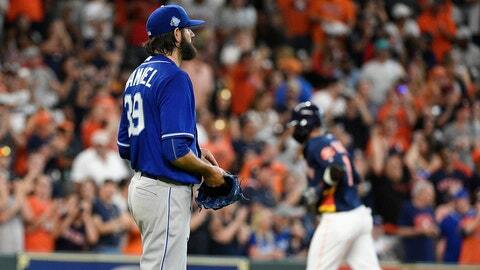 Jason Hammel suffered his ninth loss on the year, allowing nine home runs over four innings. HOUSTON – Astros manager A.J. Hinch is quite comfortable when Yuli Gurriel is at the plate when runners are in scoring position. Gurriel hit a grand slam in Houston’s eight-run second inning, helping Gerrit Cole and the Astros beat the Kansas City Royals 11-3 on Sunday. “He just has a knack for really putting the barrel on the ball and doing incredibly positive things,” Hinch said. “His balance, his bat-to-ball skills, his bat path: Everything lines up when he can execute his game plan and he doesn’t miss pitches. Houston loaded the bases with one out in the second inning, and Tony Kemp brought home the first run when he reached on catcher’s interference on Drew Butera. George Springer then lined out, but Alex Bregman walked, Altuve hit a two-run single and Carlos Correa walked before Gurriel connected against Jason Hammel (2-9) for his second career grand slam. “Put guys on base for free and make mistakes and that’s what happens,” Hammel said. “My concentration level definitely is focused when there are runners on base and guys that we want to get to score,” Gurriel said through a translator. Kansas City dropped to 3-18 in June. Hammel was tagged for nine runs, matching his season high, and walked five in four innings. All the Du-Da Day! #Royals on the board from Duda’s solo home run. Alex Bregman had been working on a mustache the last few days, but it disappeared during the game. A split-screen picture of Bregman during his at-bat in the second inning and next plate appearance in the fourth showed he had shaved at some point between the two at-bats. Royals: RHP Brad Keller (1-2, 2.63 ERA) faces the Angels on Monday in a makeup game. Last time out, Keller got a no-decision against Houston in a 7-4 loss on June 17. Keller allowed three runs in six innings against the Astros.